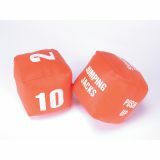 Cubes With Action, 4" x 4"
Have tremendous fitness fun!. Roll the dice and then perform the exercise: 4 jumping jacks 6 sit-ups or 10 push-ups!. One die has fitness and exercise directions (toe touch arm circles jumping jacks push ups hop on one foot and leg lifts). The other has large screen-printed numbers (2 4 6 8 10 and 12) for repetition count. Size: 4" x 4" available in Orange. Sold per pair.